Glamis Castle, Valley of Strathmore, Scotland. Home to the Royals, at one time or another. Queen Elizabeth II and the Queen Mother both have ties to this castle. This castle is neither a Historic Scotland nor National Trust of Scotland site. If you want to visit, ensure there is plenty of jingle in your coin purse. Our visit was not planned, however, a break was needed from the days travels to use the facilities. We had stopped in two small farming villages without luck of finding public washrooms, so, we agreed the next tourist trap that was posted on the motorway we would stop at.......long story short, 30GBP and we were on our way beyond the gate house towards Glamis Castle. The grounds at this castle as very impressive. A lot of land is occupied by a mix of cultured lawns, forests and the castle and grounds. As I stated in previous posts, I am interested in the photogenics of a castle more than the history. This site had a lot of visitors and it took a bit of patience and work to get angles and shots of Glamis that did not have crowds of people in the shots. For those of you who in Alberta, who may have wondered where the Town of Strathmore got its name from....I found the poster below most interesting. 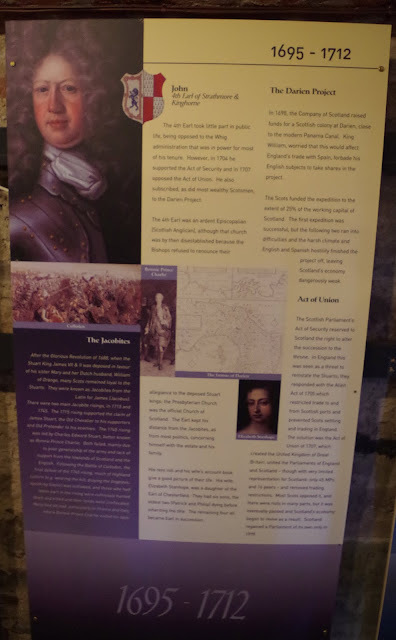 The Earl of Strathmore & Kinghorne once owned Glamis Castle, thus I will venture a guess that the Valley of Strathmore &/or The Earl of Strathmore & Kinghorne had a roll to play in the naming of Strathmore, Alberta. Of course, I could be very wrong on this. The last picture, is a look behind the scenes. The majestic views out front are brought down to Earth in the back. Here, the commoner, has access to the gift shop, parking lots, snack bar and some picnic tables to enjoy themselves. There is a very nice gift shop here, and it is quite easy to spend too much, too quick. But, that is the fun of being on vacation, right?!? So, no matter where you go on adventure, sometimes you will find an opportunity even when you make an unexpected stop. Let the adventure guide you and keep your eyes, mind and heart open. Life is too short, to view the World through a closed mind. Until next time......go see the World! !